TODAY WAS OFFICIALLY MY LAST DAY OF SCHOOL!!! :DDD And in order to celebrate, my mom and I did some shopping! First we went to the eye doctor’s, then Ulta, and lastly Katy Mills Outlet Mall. We were out from like 10:30 until 6:30, so I was able to pick up quite a few things. After I post this, I’m actually working on a haul post for any of you who are interested in seeing what I got. Anyways, this post is about how AMAZING Claire’s is. I’ll be the first to say that I haven’t been to Claire’s since 6th grade because I thought I out grew it, but I couldn’t have been more wrong. My mom and I first decided to stop because they were having a sale and she wanted to get some gifts for my cousin’s 5-year-old daughter. While there, I too decided to take a look around, and it’s fair to say that I was pretty impressed! 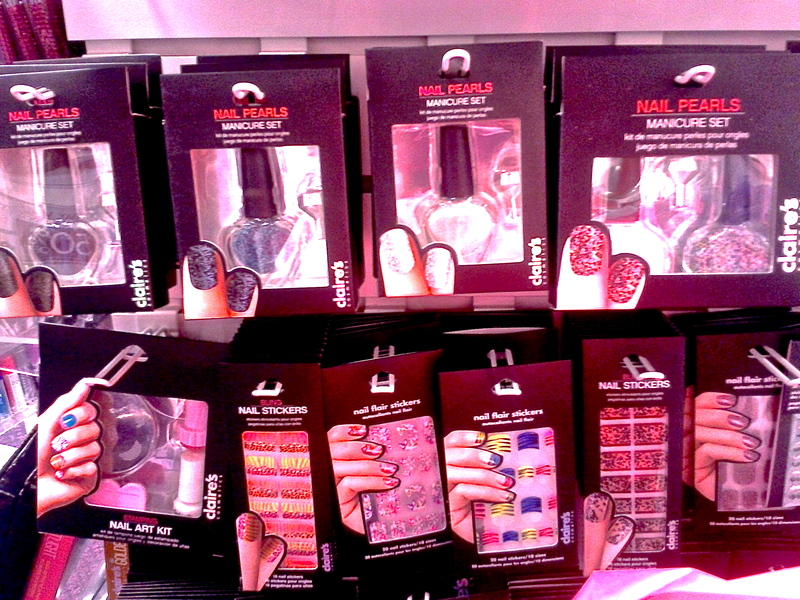 They have so many NAIL products there! These were the first things that caught by eye. 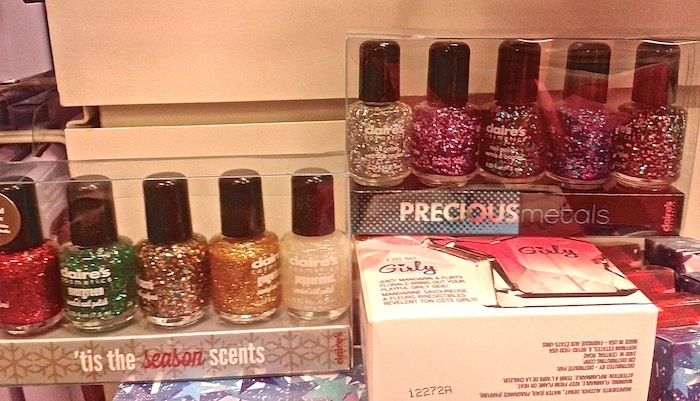 First, I saw the Precious Metals set, and I thought that the glitters in each polish were soo pretty. Then, I saw the Christmas set, which is scented! How cool is that? I don’t actually remember what the red one is, but I know that the green one is evergreen, the multi-colored one is sugar cookie, the gold one is gingerbread, and the white one is peppermint. Each set was only $10, but on top of that, they also had a discount of buy 1, get 1 50% off on all cosmetics. Anyways, I just these were pretty cool, but I was skeptical of the quality of their polishes, so if anyone has tried them out let me know! 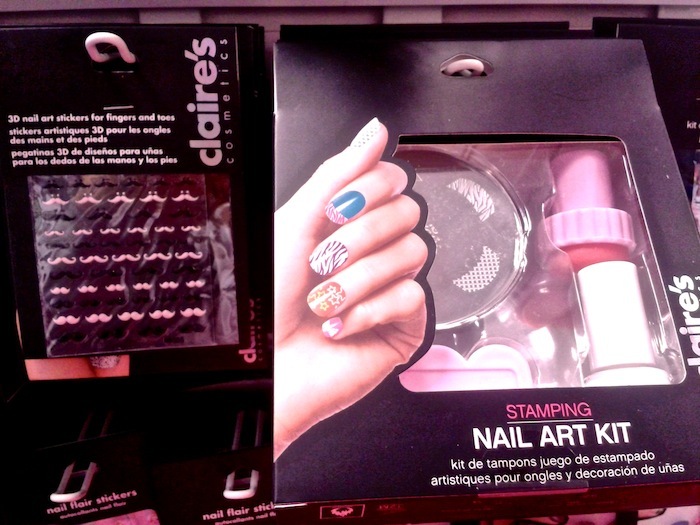 Next, they have caviar nail kits and nail stickers there! I think I actually like these caviar nail kits or “nail pearls” as they call it better than the ones that they sell at Sephora. I feel like the beads in these kits are smaller and more wearable. These are on sale for $12 and the stickers have varying prices depending on the design. Not only do they have caviar nail kits, but they also have Stamping Nails Art Kits, and these super cute moustache nail stickers. The stamping kit was $10 and the moustaches were $3.50. 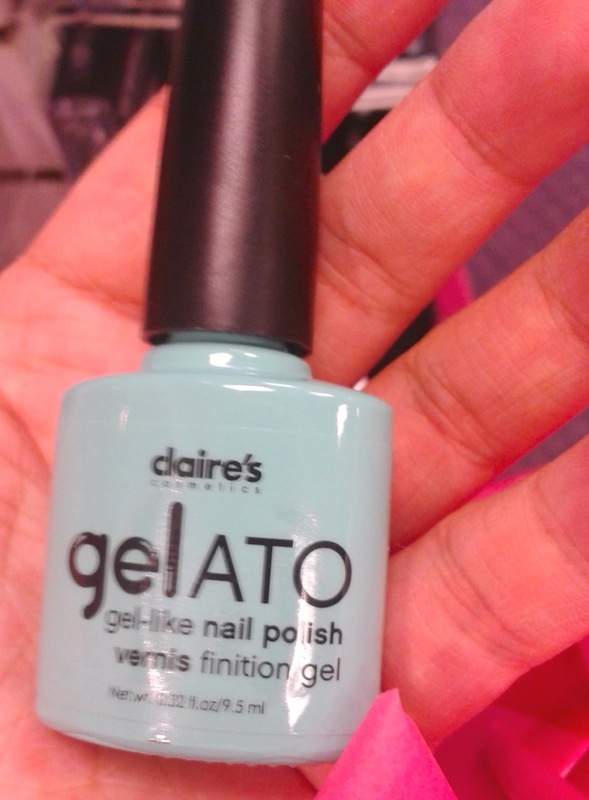 They also have gel-esque polish, which shouldn’t have been a surprise since they had all of these other products. These were $7.50… I think. But look at how cute the name is, I love it! 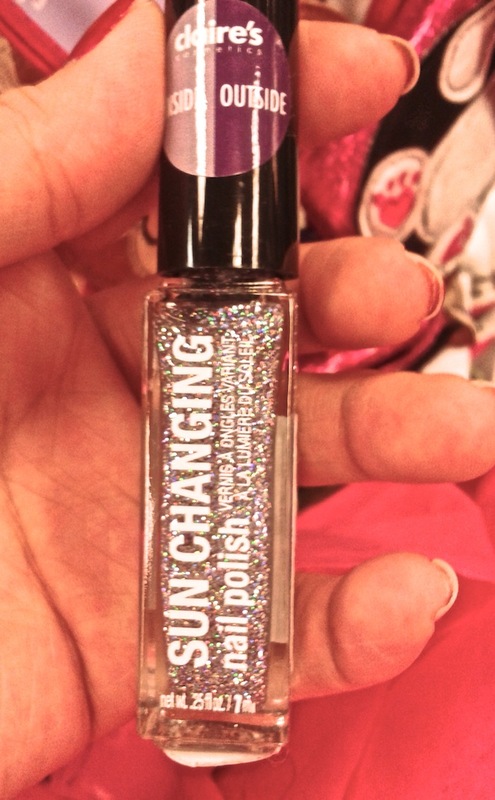 Then as we were checking out, they also had some polishes at the register that were $7. The polishes were glitter polishes that supposedly change in the sunlight. They had a few colors, but there was only one that I cared for, but unfortunately, the color didn’t pick up on camera. 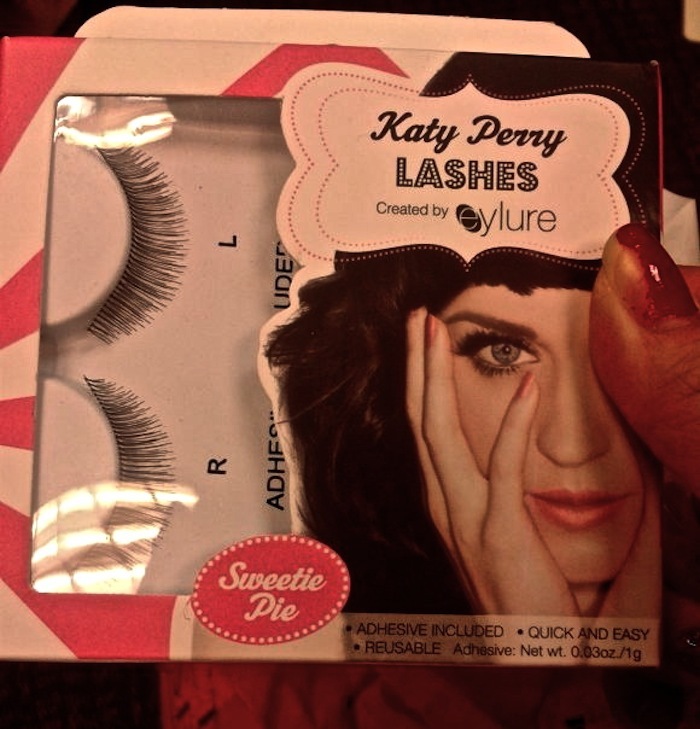 Lastly, there was one last item I wanted to talk about, which has nothing to do with nail products, the Katy Perry by Eylure false lashes. The only times I have seen them were at Ulta, and they were always the more dramatic ones, but they had some natural ones there. These were $8.50 each, which may or may not be more expensive then the ones at Ulta, I’m not really sure. So, if you’re still with me, that I was everything that I saw at Claire’s today! If you’ve tried any of the products mentioned or any other nail products, comment!! I would be glad to hear your thoughts on any of them! Hopefully, I can get my haul post up before Christmas, but if I can’t, I hope everyone has a safe and happy holiday! !